This RISE webinar is only a week away! Don’t delay, register today. Register for the upcoming free RISE Webinar Series on Wednesday, March 27, 12:15 – 12:45 p.m. “Caution, turn around don’t drown: Wellness through personal leadership development,” featuring Tina Khan, Community and Personal Leadership Consultant with Kansas Alliance for Wellness. The RISE program is a wellness initiative of KAFP designed to help Kansas family physicians RISE above burnout. Register for the upcoming free RISE Webinar Series on Wednesday, March 27, 12:15 – 12:45 p.m. “Caution, turn around don’t drown: Wellness through personal leadership development,” featuring Tina Khan, Community and Personal Leadership Consultant with Kansas Alliance for Wellness. The RISE program is a wellness initiative of KAFP designed to help Kansas family physicians RISE above burnout. 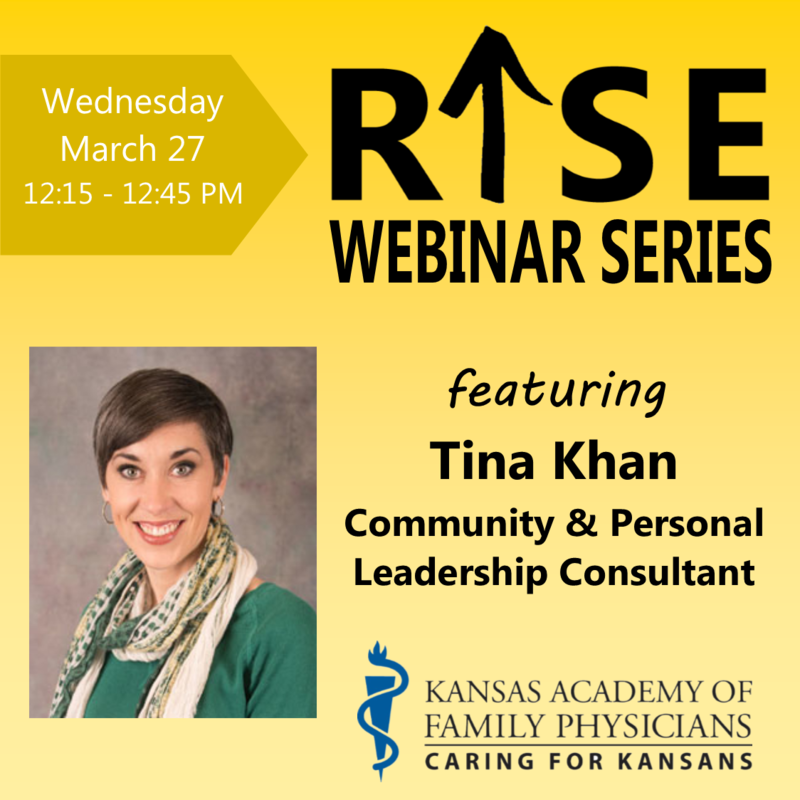 Register for the upcoming free RISE Webinar Series on Wednesday, March 27, 12:15 – 12:45 p.m. featuring Tina Khan, Community and Personal Leadership Consultant with Kansas Alliance for Wellness. Register for our fifth session in the free RISE Webinar Series on Wednesday, March 6: featuring Tina Khan, Community and Personal Leadership Consultant with Kansas Alliance for Wellness. Stay tuned for the topic to be announced soon! Register for our fifth session in the RISE Webinar Series on Wednesday, March 6: featuring Tina Khan, Community and Personal Leadership Consultant with Kansas Alliance for Wellness. Stay tuned for the topic to be announced soon! There is no charge for the RISE Webinar Series. Registration is required to receive log-in information. *This Live series activity, KAFP RISE Webinar Series, from 01/31/2018 – 10/24/2018, has been reviewed and is acceptable for credit by the American Academy of Family Physicians. Physicians should claim only the credit commensurate with the extent of their participation in the activity. Each webinar is approved for 0.5 AAFP Prescribed credits. KAFP will submit CME earned for members who participate in live webinars. Research shows it takes multiple efforts to finally give up tobacco, the number one cause of preventable death and disease in the country. Patients want to hear about the benefits of tobacco cessation from their health care providers, and these should be discussed at every visit because it may take multiple conversations before the patient decides to make a quit plan. Inform them of the new benefit, and let them know you can help them try new medication and counseling options until you find the one that works for them. In Kansas, the expanded KanCare benefits provide a better chance for patients to have successful outcomes. Let patients know about the benefits today.